Discussion in 'Buck Knives' started by gonebad395, Sep 16, 2018. Hello everyone hope you guys are having a great Sunday. 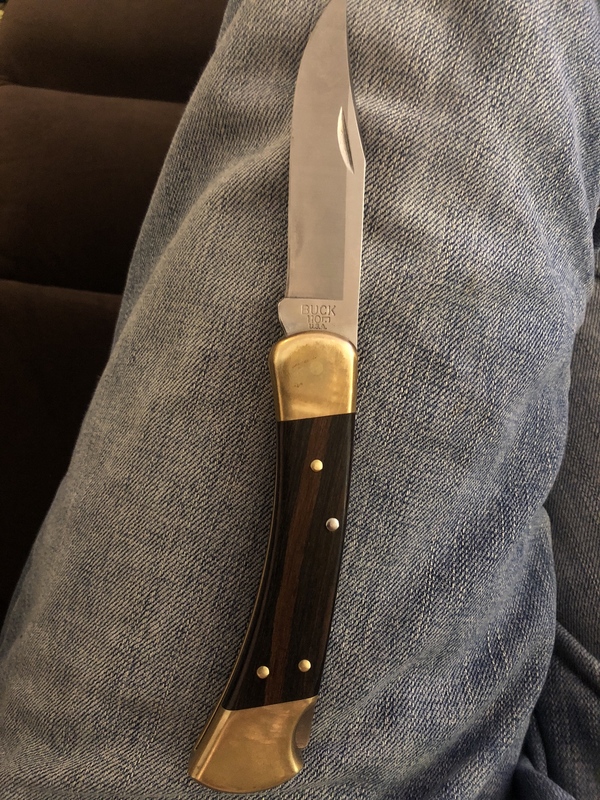 I’ve been carrying a Buck 110 for about a year now absolutely love the knive. Picked it up because my grandfather carried one most of his life that I remember. For the longest time they didn’t appeal to me I was more into the more modern folders. As I’ve gotten older my tastes started to change and I’ve been carrying the 110 and a small slip joint daily. Not that I don’t like the modern folders anymore but these older styles just feel right. So my reason for this thread is the brass on my 110 has gotten tarnished with a patina just wondering do you guys polish your 110s or let the patina run it’s course? Thanks a lot in advance can’t wait to hear what’s you guys do. some do and some dont. I do once in awhile just to keep it up. just make sure to remove the verdigris the green mess......if it develops from leather sheath storage. brass doesnt have to stay shiny, just cleaned and acidic and corrosive contaminants removed. brass is heavy zinc and zinc will corrode before the copper component in brass. so just keep up with keeping it clean. the tarnish will help protect it.....so dont worry about the browning unless ya just dont like it. MolokaiRider, Badhammer and gonebad395 like this. Your knife looks pretty darn good to me. On everyday knives I let them be mostly natural. I do wax my knives and sheaths a lot but that's simply because I always seem to have a can of paste wax open. That keeps some tarnish down, but not all. Yeah I have polished my a few times this is about a 2 month patina. I was just sitting here watching tv and my little one asked me to cut a new toy open for her. As I got to looking at it the question popped into my head figured I’d ask. What kind of paste wax do you use on your sheath and wood? I like to see the brass take on all it's many forms. Kind of like the change of the seasons. When it's time to clean up, i use Flitz polish. bflying and gonebad395 like this. I only polish my bolsters if/when I'm putting the knife up for a while. With the patina, they are not a fingerprint/smudge magnet. I am not fond of fingerprints and/or smudges on my knives. jbmonkey and gonebad395 like this. If it's a collectible 110, I polish when it needs it (I just know...). If it's a user, just don't even worry about it cause it'll still work just great, patina and all! To each, his own. For me, no polishing! zakjak221, afishhunter, gonebad395 and 2 others like this. For that reason I don't like the brass. It won't stay shiny. The patina on brass does nothing for me. gonebad395 and jbmonkey like this. I polish mine by frequently removing and then reinserting it into it's sheath. It doesn't eliminate the patina, but it does keep it from getting to dark. It has also radiusd the bolsters of my old square frame enough, that they almost match the look of the modern 110s. Never have never will polish my 110's. If verdigris appears, it gets knocked off. That's it. They get washed in hot water, or a Lysol wipe. That's it. If it bothers you, your best bet is to only buy ones with nickel silver bolsters. My preference is the earlier 500 series with SS bolsters, even the NS patinas, but not nearly as bad, and use will keep it pretty good. There are variances in the NS bolsters too. Some are darker than others. I generally let mine go -- for one thing it covers the scratches and scrapes that have accumulated over the past 40 years! But, every once in a while I decide to clean it up. I still have a can of Brasso that is at least as old as the knife and it does a good job. Other times I use Flitz. Speaking of nickel silver, I just bought a 503 and I didn't think the bolsters were quite a bright as they should be. A few minutes with some Flitz and they are very shiny. I have an old 112 and a 55. When they need polishing I give 'em a rubdown with a Miracle Cloth. Fantastic product. Thanks for all the responses guys I just polished mine I guess I could go either way on it. Got bored and cleaned the knife up then gave it a good sharpening. Still can’t belive I waited to so long to pick one up. No polish here. Love the warm look of dark, aged brass. I polish all my knives about 2-3 times a years. I can't help it I like brass to shine. They taught me to shine brass and shoes in basic training and it stuck.